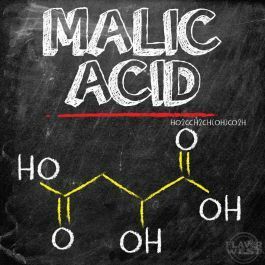 Malic Acid has an extreme tartness and enhances flavors for more sensational flavoring profile. Type: Malic Acid Powder. Ingredients: 100% Pure UPS Kosher Grade Malic Acid Powder. Usage Rate: 10% Flavor Suitability: Drinks and beverages, smoothie, desserts, pastries, baked treats and more. No Refunds on Flavoring.